Not far from the Hudson Amtrak station, there is a collection of old warehouses —one of them is Basilica, best known for being home to Basilica Soundscape, Hudson’s hippest music festival. But hidden behind this repurposed factory is another, even bigger building. 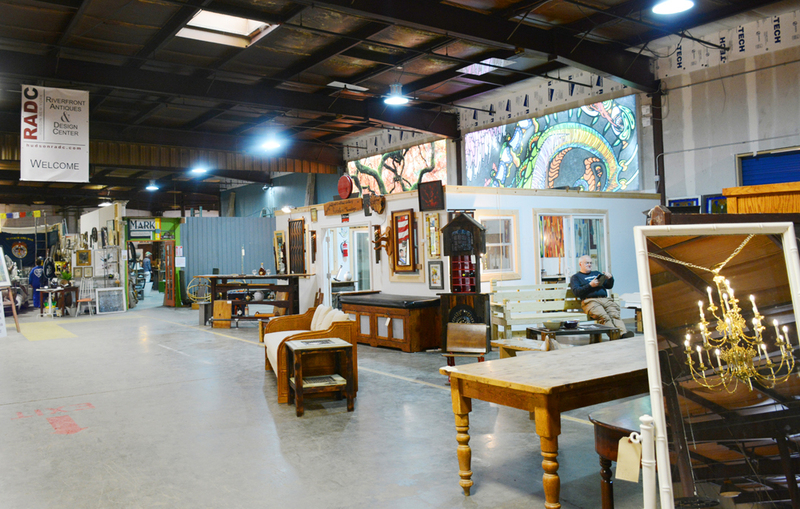 It may not look like much from the outside, but anyone who steps inside will appreciate the vastness of the Riverfront Antiques and Design Center, also known as RADC. Imagine if Ikea were a seemingly endless village of antiques and bazaar-style shops inside of a giant, old chair factory. It even has a cafe, where coffee and tea are free so you can sip and re-energize while you browse this mini city of antiques. You’re probably going to be spending quite a bit of time here. Past the first enormous entrance that is brimming with vintage furniture, antique collectibles, art, and tools, you’ll find that the space extends into individual shops, art galleries, boutiques, and stands. You also might notice that much of the warehouse is still open in the back. Since the space opened as a marketplace relatively recently, it is still getting filled with dealers and shops--and quickly, too. You might catch dealers setting up shop, building half-height walls that all bring you back to the central shopping lane, creating a leisurely, casual browse that feels like a stroll through an upscale, indoor flea market. You’d think that this place would be a major, super-instagrammed, go-to destination in Hudson, given its convenient and walkable distance from Warren Street, its great deals and picture-perfect industrial, rural aesthetic. The thing is, RADC is actually one of Hudson’s best kept secrets. Maybe it’s because it’s new, but there is no doubt that this place is going to become very popular as word gets around. There’s really nowhere else like the Riverfront Antiques and Design Center in the Hudson Valley. While Hudson has been a known antique destination for many years, nothing quite so vast, spectacular, and affordable exists outside of Hudson. RADC is enough of a destination for a perfect day trip from out of town. Only 2 hours from Penn Station and not more than a 3 minute walk from the train station in Hudson, the warehouse can be the first stop on your trip to Hudson. Whether you’re looking to purchase a new bed frame or just want to browse the vintage jewelry and clothes, there is something for everyone. From vintage tools and furniture to hand made pillows, antique toys, kitchen sets, sculptures, textiles, and much more, there are endless nooks and crannies in this massive warehouse to explore. RADC is a hopeful sign that Hudson’s once-booming, but now more expensive antique dealing scene is making its way back. Some of the shops you’ll find here include Mad Era Antiques & Reproduction, a shop specializing in Americana and European antiques, from midcentury to modern. Then there’s Tongue in Chique Antiques and Designs, specializing in different periods of antiquities, artwork, and accessories as well as Interior Design services and home staging. There’s Olde Schooner, a place that specializes in canvas awnings and seaside upholstery and a small, contained space called Art House, a gallery naturally. These are just a few of the many shops and boutiques you’ll find in this vast space. Another major draw of RADC is its location right on the Hudson River. Just across the railroad tracks is a cute riverfront park with a gorgeous view of the nearby lighthouse and a dock with tour boats that take you up and down the river. Or, you can just have a picnic on a bench under the weeping willows and watch the sunset. If you hit it in the spring, you’ll catch the white blossoming trees that line the walk from the warehouse to the park. The picturesque view of the old railroad tracks, the lighthouse, and the industrial riverfront charm make it the perfect place in Hudson for a weekend day trip. The warehouse generally is open from 11-5 Friday through Sunday, although hours vary by shop.